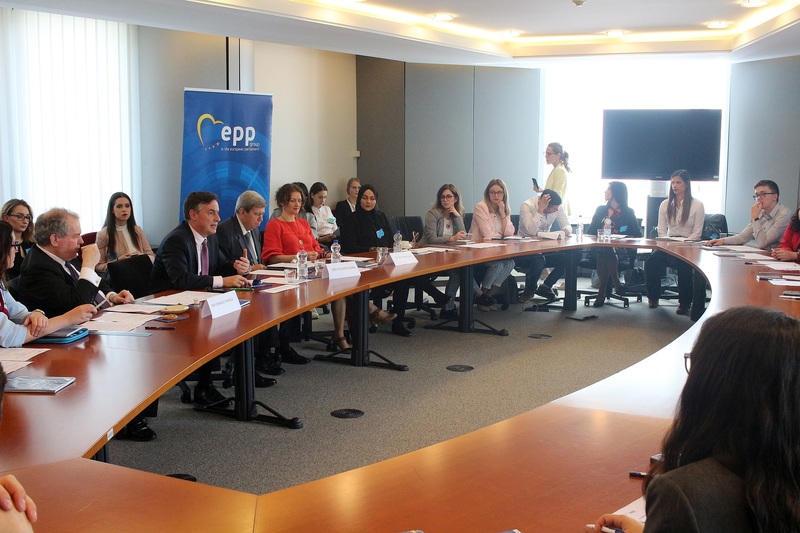 On 25 April, 2018 the teams of university students presented their recommendations on EU policy to the members of the European Parliament. Students wrote a policy brief on a topic of their choice, consisting of analysis of their national situation (based on interviews and teams’ own research) and of recommendations for EU policy. You can read the text of recommendations here: EU Policy Recommendations. Within the project of University Debates, teams from seven universities from Belgrade, Novi Sad, Chisinau, Sarajevo, Podgorica, Bratislava and Banská Bystrica will today on April 25, 2018 in European Parliament in Brussels present what they believe EU should do in and with their countries. Students gathered their information through own analysis of political situation and of European politics, as well as through interviews with their legislators in home countries, as this was a task they were to fulfill throughout the project. Today personalities such as MEP Eduard Kukan, Chair of parliamentary group between EP and Serbia, MEP Charles Tannock, EP Rapporteur for Montenegro or MEP David McAllister, Chairman of the Foreign Affairs Committee of the EP and EP Rapporteur for Serbia will today listen to the recommedations of student teams and discuss with them the policies of European Union towards their countries and regions. Since 2013, the project of University Debates has been aimed at promoting democratic values among youth. Each semester, university students at a participating university form a team to attend a workshop to develop their debate skills and to measure these in a debate organized shortly after the workshop. In addition to that, students’ teams write a policy brief on a topic of their choice, consisting of analysis of their national situation (based on interviews and teams’ own research) and to prepare recommendations for EU policy. At the time of the debate, a survey is taken among the students of all participating universities. Project is carried out by MESA10 from Slovakia and CEAS from Serbia, and supported by National Endowment for Democracy.